Let Kabbage help you cut through the red tape and get the restaurant loan you need TODAY! Visit Kabbage.com! As a restaurant owner, you have a variety of options for your restaurant financing needs. 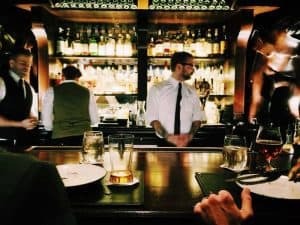 Here I will review your restaurant financing options, detail who they are right and wrong for, the advantages and disadvantages and best uses (equipment, buying, leasing, supplies, marketing, advertising, or hiring) of each loan type – plus my recommendations. >> RELATED: Read my Kabbage Loan Reviews – Right for your Business? Sadly, most banks consider restaurants too risky an investment and often turn down creditworthy candidates for restaurant loans, especially new restaurants startups. Kabbage knew that this was unfair and started their company on the premise that all businesses, yes even hospitality and food services, deserve access to restaurant financing up to $250,000. They worked hard to cut out the red tape, hassle and disappointment of waiting weeks only to be turned down by traditional lenders. You and you alone decide how you want to spend your working capital money. No banker or finance company will restrict your purchases or have any say what or where you buy your equipment or supplies. This is vital that you as the entrepreneur and leader of your restaurant have the flexibility to use your working capital for any expense such as equipment purchases, equipment lease payments, supplies, rent, payroll, events, menu designs, marketing, website design and online advertising. You know what is needed to take your restaurant to the next level of growth and make money. Funds are available for easy withdrawal either with your Kabbage Card, which works like a major credit card, the mobile phone app or online dashboard to transfer money to your business checking account – as often as once a day. Easy Online Application: Takes Minutes and Uses Your Existing Accounts to Get Funding in Hours – not months! Instead, Kabbage uses computer power and your business data to assess your restaurant loan application. The application process is completely online where you “connect” online accounts, both credit card payment processors (such as POS, Paypal, Amazon, Stripe, etc), bank accounts and accounting software (Intuit Quickbooks, Xero, Sage, and others). Then Kabbage assesses your business performance and sometimes in minutes, up to 48 hours, will notify you of your line of credit approval. Once you are approved you will have access to the money sometimes within hours to your Paypal account, or at most 3 days, if you opt for having the funds transferred to your checking account. So you can hire that new chef, buy those advertisements and order new supplies or equipment right away just in time for your busy season or that big catering event or party. These loans have very clear and easily understandable repayment terms. In fact, you can use their online loan calculator to see EXACTLY how much your interest rate will be, your total loan cost, repayment amounts, and due dates. This way you can review your repayment schedule and amounts and determine if they work with your budget before you accept the loan – helping your cash flow continue to flow. You will not be surprised by unexpected loan payments on inconvenient dates, squeezing your budget and requiring reallocating of your funds and extra accounting tasks. Unlike other short-term alternate lenders, Kabbage does not charge you origination fees nor prepayment penalties fees, reducing your cost of capital which increases your profit margin. Loans for financing, working capital, equipment leasing or purchasing, payroll, rent, and marketing advertising. Right or Wrong For You? WRONG FOR: Businesses needing working capital with no expansion plans ADVANTAGES: Access to startup capital with no repayments, no tax penalties and no interest rates. Improved business success rate due to no drain on early profits with monthly repayments.